Today's VETgirl online veterinary continuing education guest blogger is Dr. Kathryn Vickery, VMD, MS, DACVIM (Oncology), CVA of Hope Veterinary Specialists. She'll review chemotherapy and the adjunct benefits of acupuncture to help our veterinary oncology patients! One of the major tenants of veterinary oncology is to improve and support the patient’s quality of life while controlling the cancer. To accomplish this goal, veterinary chemotherapy protocols differ from physician based chemotherapy protocols in several ways. Veterinary protocols utilize reduced doses of chemotherapeutic agents, drug holidays are provided between treatments to allow for a recovery period, and single agent chemotherapy protocols are used more often than in physician based oncology1. Despite these measures veterinary patients still experience side effects with studies reporting 20-40% risk of vomiting and/or inappetance, 30% risk of diarrhea, and 20-40% risk myelosuppression1-4. With side effects come not just physical consequences to the patient, but diminished client enthusiasm, financial burden, and potential treatment delays which may alter the overall efficacy of treatment. In addition to potential side effects from chemotherapy treatment, veterinary patients may also experience diminishing quality of life from the tumor itself causing symptoms such as: gastrointestinal upset as in the case of gastrointestinal tumors or ulcers from mast cell neoplasia, bone pain from osteosarcoma or other primary or metastatic bone lesions, bladder discomfort from transitional carcinoma of the bladder, or fatigue from lymphoma. Chemotherapy side effects and tumor related symptoms affect people with cancer as well. In addition to traditional treatment for these symptoms including narcotics and anti-emetics, both of which may have potential side effects on the patient, many physicians are now recommending acupuncture as a treatment option to help reduce the side effects of chemotherapy and tumor symptoms5. Human and veterinary studies have demonstrated the benefit of acupuncture for conditions including: pain6-9, immune dysregulation and inflammation10,11, and nausea12,13. In 1998, the National Institutes of Health (NIH) published a consensus report summarizing research findings which confirmed positive benefit on the effectiveness of acupuncture for chemotherapy-induced nausea as well as post-operative pain secondary to tumor removal in people5. This report sparked major interest in acupuncture as a complement to physician-based Western Medicine. Since 1998 there has been a surge in funding to support research evaluating the molecular mechanisms and the clinical benefits of acupuncture14. As more and more positive research is published, Western medicine practitioners are gaining confidence in using this modality as a tool in their tool-belt. It is not surprising that the top tier, world-renowned U.S. Cancer Institutes such as, Dana-Farber in Boston, Sloan-Kettering in New York, and MD Anderson in Houston, all have integrative medicine programs closely associated with their Cancer Centers. Acupuncture has three key elements: acupuncture point, stimulating method, and therapeutic effect. Research has demonstrated that the acupuncture point has high electrical conductivity, low electrical resistance, and contains large numbers of arterioles, lymphatic vessels, nerve endings, and mast cells6. The most common stimulating techniques involve needle alone or electroacupuncture (use of low level electricity connected to a needle in an acupoint). Acupuncture modulates the activity of peripheral and central neural pathways6,9-11. As the point is stimulated, there is activation of peripheral and central neural pathways, leading to an effect on hormones, cytokines, neurotransmitters, and other chemical mediators in the body6,9-11. Research from physician-based medicine supports the use of this modality for the human oncology patient. One of many studies was chosen to be summarized. This study is a three-armed, randomized, prospective clinical trial published in The Journal of the American Medical Association13. Women with high grade mammary carcinoma, treated with high dose myeloablative chemotherapy, were randomly assigned to three separate groups: anti-emetic alone, anti-emetic with electroacupuncture, anti-emetic with acupuncture at non-therapeutic locations on the body. The study found that women in the anti-emetic with electroacupuncture group had significantly less vomiting episodes compared to women in the two other groups (anti-emetic alone and anti-emetic with non-therapeutic acupuncture)13. In veterinary medicine, there are multiple research reports demonstrating the benefit of acupuncture for alleviating pain6, 15-18 and nausea12 for the veterinary patient. One study evaluated the potential for acupuncture to reduce signs of nausea and vomiting in healthy dogs after injection of a known emetic substance, morphine. Koh, et. al. published their findings in The Journal of the American Veterinary Medical Association12. 222 healthy dogs were prospectively randomized into one of six treatment groups: injection of saline solution, injection of maropitant citrate, injection of acepromazine maleate, electroacupuncture treatment at 1 acupoint, electroacupuncture treatment at 5 acupoints, or a non-therapeutic electroacupoint treatment. Morphine was administered 20 minutes after these treatments. Vomiting and other signs of nausea were recorded for 20 minutes after morphine injection. Results of the study showed that the incidence of vomiting was significantly lower in the maropitant group (37.8%) compared to the saline (75.7%) and non-therapeutic acupuncture (86.5%) groups. The number of vomiting events in the maropitant (21), acepromazine (38), 1-acupoint (35) and 5-acupoint (34) groups was significantly lower than in the saline solution (88) and non-therapeutic acupuncture (109) groups. 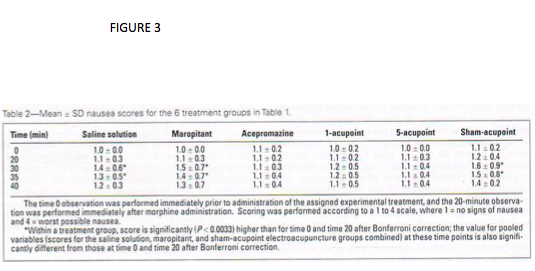 Mean nausea scores for the saline solution, maropitant, and non-therapeutic acupuncture groups increased significantly after morphine administration, whereas those for the acepromazine, 1-acupoint electroacupuncture, and 5-acupoint electroacupuncture groups did not. The study concluded that maropitant treatment was associated with a lower incidence of vomiting, compared with control treatments. 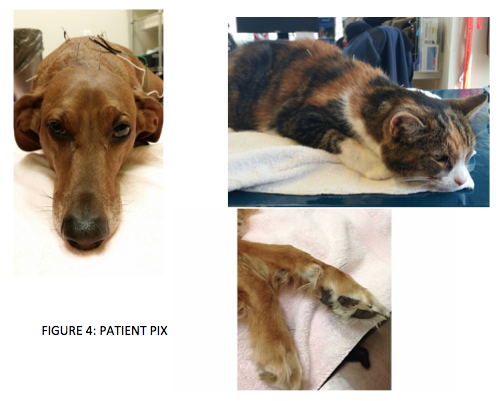 In addition they concluded that the acepromazine and electroacupuncture treatment seemed to prevent an increase in nausea scores following morphine administration in this subset of studied dogs. In veterinary medicine, there are many research reports supporting the use of acupuncture for controlling pain due to orthopedic and/or neurologic cause6, 15-18 and controlling nausea due to morphine injection12, however there is a paucity of data evaluating the benefits of acupuncture specifically for the veterinary oncology patient. The good news is that there is a large amount of data in the human literature which supports acupuncture as a beneficial adjunct therapy to traditional treatment for the cancer patient. In addition, there is research to support the use of acupuncture for one of the most common side effects of chemotherapy in dogs, vomiting and/or nausea, as described above in the research report by Koh, et al. The goal of acupuncture is to support the patient while living with and receiving treatment for cancer. As pioneers in veterinary medicine, we must look to our physician colleagues for ways to advance our field. By applying what we know from human medicine to the veterinary patient, veterinarians are able to further develop the field, embark on potential clinical research projects to help improve the scientific database, and most importantly, provide well rounded care for our cancer patients. The future is bright! 1. Cancer Chemotherapy. Gustafson DL and Page RL. In:Withrow MacEwen Small Animal Clinical Oncology. eds. Saunders. 2013. pg 157-179. 2. Fasting Reduces the Incidence of Delayed Type Vomiting Associated with Doxorubicin Treatment in Dogs with Lymphoma. Translational Oncology. Withers SS, Rebhun RB, et al. 2014. 7(3): pg 377. 3. 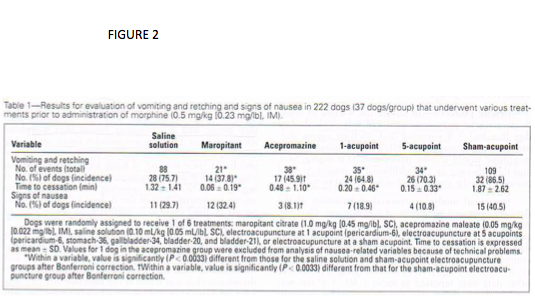 Efficacy of Maropitant in the Prevention of Delayed Vomiting Assoc with the Administration of Doxorubicin to Dogs. Journal of Veterinary Internal Medicine. Rau, SL, et al. 2010. 24: pg 1452. 4. Gastrointestinal Toxicity after Vincristine or Cyclophosphamide Administered with or without Maropitant in Dogs: A Prospective Randomised Controlled Study. Journal of Small Animal Practice. Mason SL, et al. 2014. 55(8): pg 391. 5. NIH Consensus Conference. Acupuncture. J Am Medical Assoc. 1998. 280: pg 1518. 6. The Validity of Acupuncture in Veterinary Medicine. Am J Trad Chinese Vet Med. Xie Huisheng, et al. 2012. 7(1): pg 35. 7. 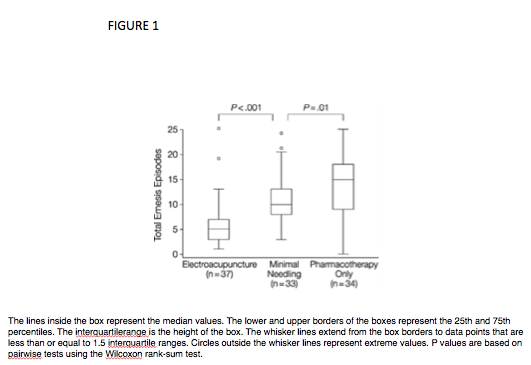 Analgesic Effect of Electroacupuncture in Post-Thoracotomy Pain: A Prospective Randomized Trial. Annals Thoracic Surgery. Wong RH, et al. 2006. 81: pg 2031. 8. Randomized, Blinded, Sham-Controlled Trial of Acupuncture for the Management of Aromatase Inhibitor-Associated Joint Symptoms in Women with Early-Stage Breast Cancer. Journal Clinical Oncology. Crew KD, et al. 2010. 28: pg 1154. 9. Molecular Mechanisms Underlying the Effects of Acupuncture on Neuropathic Pain. Neural Regeneration Research. Ju Z, et al. 2013. Sept 5; 8(25): pg 2350. 10. Effects of Acupuncture on Leucopenia, Neutropenia, NK, and B cells in Cancer Patients: A Randomized Pilot Study. Evid Based Complement Alternat Med. Pais I, et al. 2014. 217397. 11. IL-10 Cytokine Released from M2 Macrophages is Crucial for Analgesic and Anti-inflammatory Effects of Acupuncture in a Model of Inflammatory Muscle Pain. Molecular Neurobiology. da Silva MD, et al. 2015. 51(1): pg 19. 12. Effects of Maropitant, Acepromazine, and Electroacupuncture on Vomiting Associated with Administration of Morphine in Dogs. J Am Veterinary Medical Assoc. Koh RB, et al. 2014. 244 (7): pg 820. 13. Electroacupuncture for Control of Myeloablative Chemotherapy-Induced Emesis: A Randomized Controlled Trial. J Am Medical Assoc. Shen J, et al. 2000. 284: pg 2755. 14. The Value of Acupuncture in Cancer Care. Hematology Oncology Clinics North Am. Lu W, Dean-Clower E, et al. 2008. 22(4): pg 631. 15. Effectiveness of Electroacupuncture Analgesia Compared with Opioid Administration in a Dog Model: Pilot Study. British J Anaesthesia. Groppetti, D., et al. 2011. 107: pg 612. 16. Comparison of Decompressive Surgery, Electroacupuncture, and Decompressive Surgery followed by Electroacupuncture for the Treatment of Dogs with Intervertebral Disk Disease with Long-Standing Severe Neurologic Deficits. Journal Am Vet Med Assoc. Joaquim, et al. 2010. 236 (11): pg 1225. 17. Outcome of 119 dogs and cats treated at the acupuncture unit of the Faculty of Veterinary Medicine and Animal Science of the University of São Paulo State. Brazilian J Veterinary Research and Animal Science. Angeli, et al. 2005. 42 (1): pg 68. 18. Evaluation of electroacupuncture treatment for thoracolumbar intervertebral disk disease in dogs. Journal Am Vet Med Assoc. Hayashi, et al. 2007. 231 (6): pg 913. Author: Dr. Kate Vickery is a board certified medical oncologist and certified veterinary acupuncturist for Hope Veterinary Specialists, Pennsylvania. She attended veterinary school at the University of Pennsylvania then completed a residency and master’s degree in medical oncology at Colorado State University, Flint Animal Cancer Center. She became certified in veterinary acupuncture from the Chi Institute, Florida. Dr Vickery uses acupuncture, in conjunction with traditional cancer treatments, to help support her patient’s quality of life and potentially decrease side effects from cancer treatment. She has published articles in peer-reviewed journals and is excited to continue research on the benefits of acupuncture for the oncology patient.